Though pearl milk tea (or bubble tea) has been waning in Hong Kong for a while, it’s apparently still able to draw a crowd — particularly when it caarges only 12$ HK for a big cup. 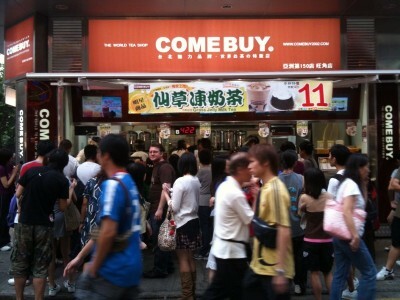 Above: Come Buy, a Taiwanese chain in Mong Kok. Source: Casey’s Fist of Fun.